Tartan Necklace Pendant, Plaid, Scottish Clan. 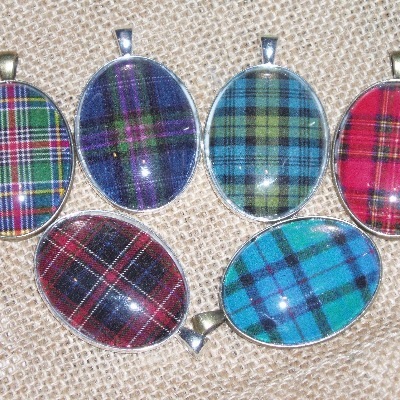 Plaid Tartan handmade 30x40mm oval glass photo cabochon set in a brass or silver plated setting on a choice of chains. Also choose the pendant metal colour and the chain. Very Scottish, and the perfect gift to send overseas. Pendants shown in the photo are Webb Modern, Scotland the Brave, Clan Grant and Royal Stewart in the top row, with Clan MacDonald and Flower of Scotland in the bottom row. Actual pendants are brighter than those shown in the photo.